Stretching between the Black Sea and the Caspian Sea, Great Caucasus boasts several of the world’s highest peaks. With unlimited access to long powder-filled slopes, lush forest trails and glaciated terrains, the Caucasus is home to some of the best ski resorts in Russia. 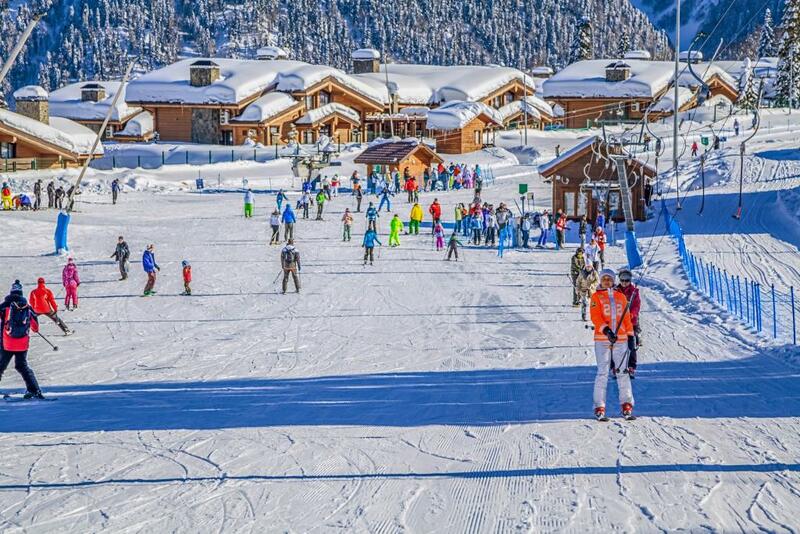 The most famous Russian ski resorts located within the Caucasus, is the well-known ski resort, Sochi. Sochi attracts millions of local and international ski tourists yearly, making the ski industry attractive to investors and state-owned ski resort companies. The construction of amenities built for the 2014 Olympics has laid the bricks for a growing new "winter-economy" in the Caucasus. In the tailpipe of the Olympics, the ski tourists have opened their eyes for the skiing possibilities within the northern Caucasus Mountains. Aside from the excellent snow and diverse skiing terrain, Russian ski resorts offer a budget-friendly ski holiday not only to ski enthusiasts but to families too. With prices ranging from $17 to $30 for a full day pass, it is significantly cheaper to ski in Russia than any other ski resorts in North America and Italian Alps. Several modern ski resorts have subsequently opened to accommodate the growing demand for tourists wishing to conduct their ski holiday in Russia. Let's examine some of the top ski resorts in Russia. Ski resort where even comrade Putin would take his skiing. Located just 42 km away from the city of Sochi, lies Krasnaya Polyana ski area. The Krasnaya Polyana Ski area is where the alpine competitions for the 2014 Olympic games where held. Krasnaya Polyana ski resort receives an abundance of snowfall until late May, offering perfect condition for everyone throughout the winter season. After winning the bid to host the 2014 Winter Olympics, Krasnaya Polyana’s poor infrastructure was transformed into one of the most accessible and most sophisticated ski resort in Russia. The state of the art amenities and top-notch infrastructure has turned Krasnaya Polyana into one of the most extensive and fastest growing ski resorts within Russia. Krasnaya Polyana ski resort receives an abundance of snowfall until late May, offering perfect condition for everyone throughout the winter season. Comprised of four ski resorts, Rosa Khutor, Alpica, Gorky Gorod and Gazprom, the entire ski area of Krasnaya Polyana has over 150 km of slopes. Krasnaya Polyana’s vertical drop is 1785m, measuring from the highest summit at Rosa Khutor (2,320m) and the base area at Alpica (535m). Krasnaya Polyana the longest run measures 7km. The full ski area resort has a total 62 lifts and 23 ski runs. Out of those 23 ski runs, 55% is for beginners, 40% is for intermediate skiers, and only 5% for experts. Krasnaya Polyana is blessed with plenty of snow in the winter season with an average of 2m at the highest peak. Gazprom’s wide and flat slopes are great for beginners and Gorky Gorod’s pistes, dedicated mainly for intermediate skiers, including a 3km trail used for night skiing. Alpica offers 25 km of slopes and ten lift. Rosa Khutor, the largest single ski resort not only in Krasnaya Polyana but in all of Russia, has 77 km of slopes and 25 modern ski lifts. The resort is open all year round thanks to its massive artificial snowmaking machine. Rosa Khutor is the highest ski resort in all of Krasnaya Polyana, and has an alpine terrain which incudes several off-piste possibilities and a snowboarding park. Rosa Khutor is home to the most difficult within the entire ski area - the 4.7km long run called "Crazy Khutor." The 2014 Sochi Games held at Krasnaya Polyana is the most expensive Olympic event on record. A railway was built from the resort to central Sochi to make it more accessible to the public. The resort is equipped with cameras for live broadcasting and security purposes and features Europe’s biggest snow-making machine. The resort, also known as ‘Russian Courchevel,’ offers a diverse range of winter activities like paragliding and snowmobiling. Other fun family activities and attractions like the Panda Park and numerous après-ski venues are primarily found at Gazprom. Gazprom is, besides being the name of a government-owned Gas company, one of Putin’s favorite ski resort. The dormant, twin-coned volcano Mt. Elbrus (5,642m), located in Southern Russia, is Europe and Russia’s highest mountain. Skiing the Mt. Elbrus-Azau ski resort provides an excellent opportunity to ski one of the world’s Seven Summits. With 3,810 m as its highest ski level, Mt. Elbrus-Azau has consistent never-melting snow year round. The fresh mountain air and the stunning views spanning the neighboring countries (Georgia, Armenia, and Azerbaijan) makes skiing at Mt. Elbrus-Azau a remarkable experience. Elbrus-Azau skiing terrain is not huge. It is composed of 35 km slopes and 27 trails which are primarily suited for intermediate and expert skiers. Majority of the slopes are wide and open and located between the 2.35 km and 3.85 km elevation with the longest run measuring 2.5 km. 7 lifts service the resort and the resort’s peak can be reached by a unique system of cable cars that can go as high as 3800 m.
For adventure-seeking people who enjoys cat-skiing, snow-tractors are readily available to take them to the summit of Pastuhov rocks (4,800m). Alternatively, a helicopter ride can be chartered to reach the mountain’s notorious peak. Elbrus is locally known as "Mengi Tau - the Mountain of a Thousand Mountains." Reason for this is due to the 145 sq.km of natural glaciers which creates the appearance of smaller mountains on the slope of Elbrus. At the Garabashi track (3,962m), Mt. Elbrus-Azau ski resort features a one of a kind oasis for skiers called ‘Barrel Huts.’ The huts are made of insulated oil tankers that are being kept warm by an electric heating system and can fit up to 20 people at the same time. Tsey Gorge is where the dense forest and gorgeous bodies of water meet the soaring alpine meadows in Central Caucasus. Tsey ski resort, built on the slopes of Mt. Uilpata (4,648m) is one of the highest Russian ski resorts. Tsey is also located in the Caucasus Mountains. Tsey ski resort belongs to North Ossetia State National Park, the center of tourism in North Ossetia-Alania. The forested lowest part of the gorge at 1300 m is filled with lush valleys, ravines, stunning waterfalls, and small rivers, making it a remarkable trekking terrain in the summer. In winter, Tsey’s abundant snow and diverse terrain provide a decent skiing experience suitable for all skill levels. The resort may not have a huge skiing arena, but it provides unforgettable skiing and snowboarding experience with the resort’s majestic mountains as a backdrop. Tsey ski resort has a total of 7 tracks, 3 km in total with 2 blue runs for beginners, 3 red runs and 2 black runs for advanced skiers. There are only two chairlifts stationed at Skazskly glacier at 2,870 m.
Tsey gorge is one of those Russian ski resorts that have a rich culture and ancient mountains. In the woods of Tsey gorge ski resort lies Rekom Sanctuary, an ancient and sacred log shrine, named after the primitive Ossetian deity. Another tourist attraction in the resort is the Mountain Monk (2,990 m). The legendary mountain resembles a monk with his face hidden under his hood. According to the myth, the monk was transformed into a rock when he failed to keep his promise of catching a Goldenhorn (legendary goat with long golden horns). 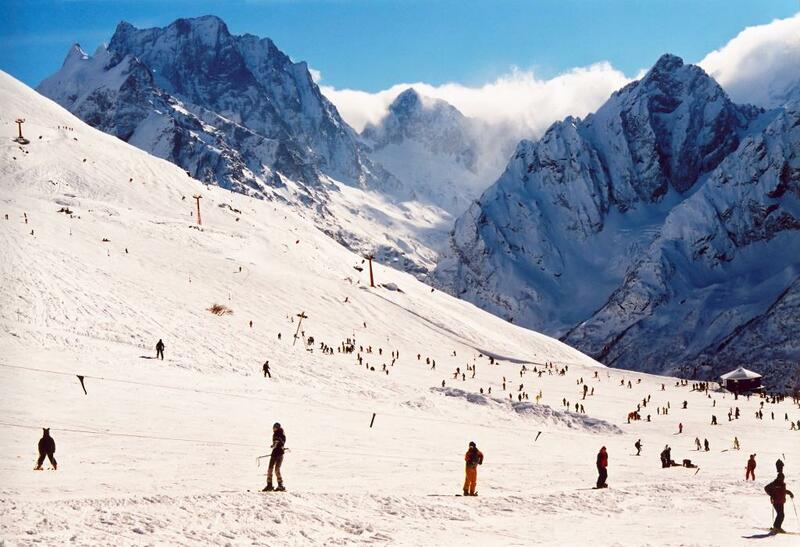 Dombay ski resort is one of the most famous Russian ski resorts in the Northern Caucasus. Located in the Republic of Karachay-Cherkessia, 60 km to the east of Mt. Elbrus, the mountainous and snowy territory of Dombay is one of Russia’s oldest sports and leisure center. Dombay is well-known for its wide variety of skiing terrain. This includes several forest and backcountry trails along with steep terrains for freestylers and heli-skiers. For safety precautions, professional guides are required to accompany free-riders because several of the off-piste terrains are prone to avalanches. Numerous after-ski activities are also available in the Dombay ski resort including ice skating, snowmobiling, paragliding, and horse-back riding. There are lots of restaurants offering tasty Caucasian cuisine and markets where guests can buy souvenirs and Dombay’s famous honey. Saunas and indoor pools are also offered by most of the hotels in the resort. Dombay ski resort has three large ski areas and 15 lifts in total. The elevation within the ski are goes from 1,800m and up to 3,200m. Local skiers and snowboarders love the ski resort for its well-developed lift system and resort infrastructure. Dombay ski resort has 27 ski slopes totaling more than 20 km. Only a few f those slopes are for children and novices whereas the majority of ski runs suitable for advanced skiers. Most of the best trails are located on the southwest slopes of Mt. Myssa-Achitara (3,012 m) with the longest run measuring 3.5 km. Dombay is another one of the Russian ski resorts that feature several freeriding tracks. The slopes of Mt. Semenov-Bashi (3,602m) offer around 4 km backcountry and heli-skiing downhill trails. Skiing the slopes and glaciers of Mt. Alibek is another option for free riders. Foot or a helicopter ride can only reach these areas. Locally called as ‘the heart of mountains,’ Dombay is surrounded by numerous mountains including Mt. Sulakhat (Sleeping Beauty) and Mt. Belialakaia (Stripped Mountain). The highest mountain in the resort, Mt. Dombay Ulgen (4,046m) means ‘killed bison’ in Turkish language. Located on the slopes of Mt. 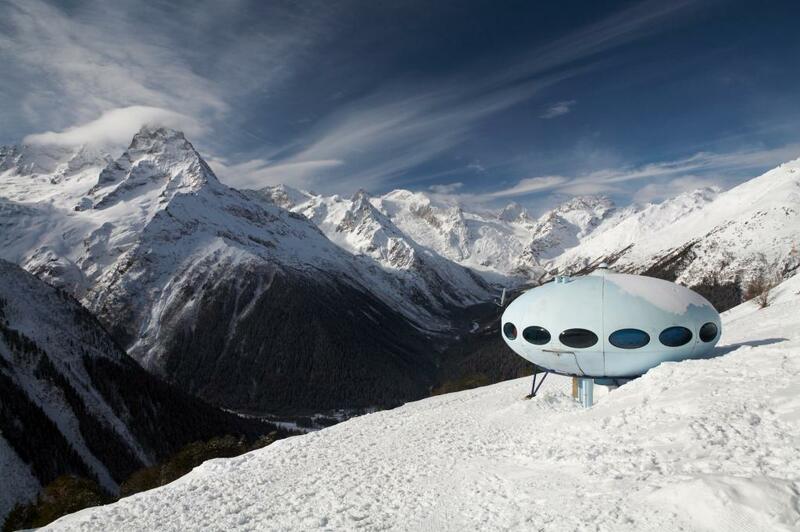 Myssa-Achitara, is hotel Tarelka’s famous Futuro, a UFO-shaped hotel that can accommodate 8 guests. Designed by Matti Suuronen, the hotel has an altitude of 2,400 m and provides fantastic views of the mountain summits.